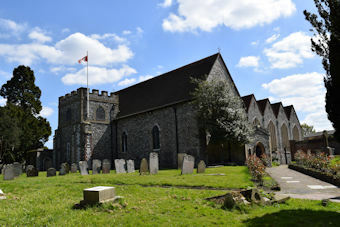 A large churchyard with the new section located on the opposite side of Ramsden Road and which contains Canadian Corner where Canadian military casualties from WW1 are buried. About 60% of the gravestones in the Old Churchyard have been indexed. Only the CWGC gravestones have been indexed in the New Churchyard. All accessible monuments within the church have been indexed. The GPR holds 200 grave and 505 person records for the burial ground.